On these matters, Steve DeGroof e-mails to say: "Not sure if this would work but have you considered using airbrush nozzles? They typically come in 0.6mm, 0.4mm and 0.2mm sizes. You usually have to order the nozzle, needle and cap as a set but they should still be fairly inexpensive." This seems a neat idea to save people having to machine nozzles. Undaunted, I drilled out the hole left by the shaft to suit Meccano shafts, and tapped a shaft gently home with a large mallet. If I had been thinking, I would have sprayed a little oil in at this point, and anchored the shaft in the vertical position. Hot Polymorph was pressed firmly into the hole around the shaft, and a 2-hole Meccano collar pushed in on top. One of the holes embedded itself nicely in the Ploymorph, and the other stuck out allowing me to attach the collar to the shaft with a grub screw. For a permanent fit, Adrian suggests puting a flat on the shaft. Getting it out was a mission, as the Polymorph had invaded the cavity well. Consequently, the gear was slightly distorted after extraction, and mildly eccentric. This was fixed up with a hot knife, and re-centred after warming the shaft with a hair dryer. The gear is now in use in the Meccano trolley prototype and will do until I can get a replacement FDM'd up. As it is on a collar with attachment grubscrew, I have been able to change my mind over the length of the shaft it is mounted on a couple of times. Emulating this in an FDM'd model will be fun! I thought I'd better document an idea that I saw in O'Reily's "Make" blog while looking at postings about RepRap - I'm unable to find the original link. The concept was to use a rotating turntable and a moving laser pointer in conjunction with a video camera and some clever software to scan in and digitise an object. 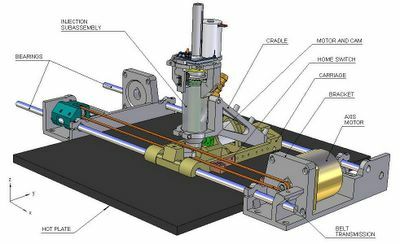 Well, the Meccano turntable would both rotate and lower the object simultaneously so a static laser pointer could be used. As the method was already proved, it would appear that RepRap + laser pointer + video camera = 3D scanner. Unfortunately I'm a bit busy making the fabricating side of things, but if anyone wishes to make a turntable-based scanner do let me know how you get on! I decided to try some more extrusion experiments with it. I cut off all but a few mm of the thread, drilled out that thread from the back with a 1.5 mm drill almost but not quite to the top face of the head, then finished the hole with an 0.4mm drill (which is quite tricky to hold in a chuck, I can tell you...). Then I turned the head down to a shallow cone in a lathe. Next I made an aluminium block with a 4mm hole almost all the way through, and tapped the last few mm at M4 for the nozzle. I cut a slot in the block to fit the heater out of a glue gun. I greased a 4mm plastic rod with vaseline, put a tight-fit O-ring on it, and pushed it down the 4mm hole. In an oven set at 100 degrees C I cast a block of isocyanate/polyol thermoset round this to give a lead-in for the polymorph rod where it would be kept at a low enough temperature to maintain it as a solid. Here came a piece of serendipity: isocyanate+polyol normally needs to be cast in a vacuum to outgas it in order to get a decent result. But here the bubbles it generates as it sets became a positive advantage - they made the block weaker, but they lowered its thermal conductivity, keeping the right-end cool, even when the aluminium block was at full temperature. The isocyanate held the O-ring well, giving a good seal. Not shown on the diagram above are 4 M3 screws. I drilled and tapped the aluminium block M3 where it would join to the thermoset and put four screws in with their heads protruding about 4 mm. These were to give a strong key for the thermoset to hold it onto the block. Before I did all this I boiled up a scrap lump of isocyanate in cooking oil - it was stable and happy up to at least 180 degrees C. Here is the finished extrusion head together with a rolled length of polymorph. The hole bottom right is for a thermometer. As Vik found, the 4mm polymorph rods are very easy to make. You just put a lump of the stuff in boiling water to soften it, take it out, and roll it between two flat rigid plates using a 4mm diameter rod to get the thickness. You might imagine that you would get the best results with two such rods, one either side of the rolling polymorph, but it actually works better with just one. This gives a slightly undesized rod, as the plates are at a slight angle to each other. But the physics of the situation makes the polymorph roll immediately adjacent to the rod, so the reduction in diameter is very small. And, if you stop rolling before the polymorph fully sets it springs back a small amount, compensating for its reduced diameter. I used polymorph granules from Maplin, but Vik also found a company (see below) making a similar material already in rod form: WFR / Aquaplast. Finally I put the whole thing together, plugged in the heater, and pushed the polymorph rod through by hand. I would guess that I was using a force of about 70N. The material extrudes well at around 120 to 130 degrees C. Note the change in colour as it sets. The final diameter was 0.5mm, indicating a small amount of die-swell, as would be expected. Polymorph samples have now arrived in New Zealand and have already found a use as gripping pads for the drive belt. This will be fitted directly to the Meccano trolley for the test phase. An experiment was performed to see if simple centrifuging of a syringe of hot polymorph can drive out the air bubbles. It can, but unfortunately, the resulting polyblob cannot be extruded from the syringe, even when boiled. 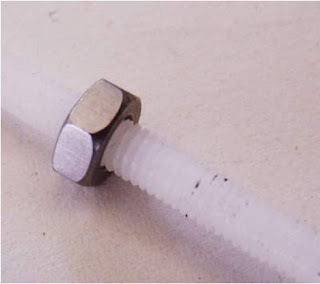 As the syringe is also somewhat pliable at this point, it can be squeezed, separating the hot polymorph from the side of the syringe barrel and rescuing the syringe. The FDM'd brackets arrived and are fine, except for a user malfunction that resulted in the holes being designed precisely 1mm too narrow. Expect an update to the AOI files in the near future. Samples of magnetic rotation counters - which will be impervious to dust and other deposited crud - have been approved by Allegro, and dispatch is expected shortly. These are sensitive enough to detect individual teeth on a ferrous gearwheel rotating at 1,000+ RPM. They are designed for automotive applications, and so should ultimately be available from car spares suppliers. 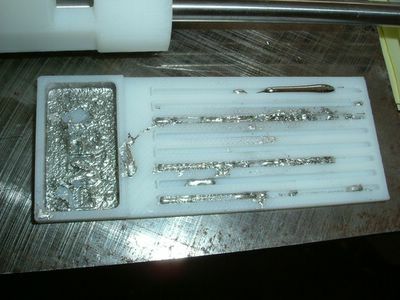 I've made an axis (like the kind you'd find in a printer) which can deposit molten bend alloy into casting channels in a pre-manufactured component. The key thing is that the axis was desinged in-line with the self-replicating idea: most structural parts are made using RP technology, and most other parts are from the accepted parts list. 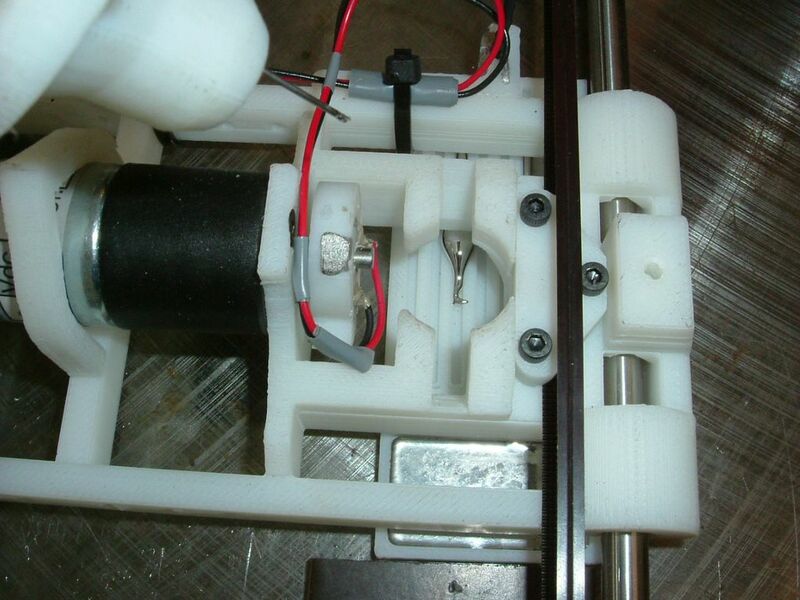 There are a few exceptions to this, like linear bearings and a tooth belt, but that's OK for the first prototype. On Friday the axis dripped its first drip! We put a test plate (with lots of straight channels in it) under the needle, fired up the stepper motor to move the carriage and started pumping the injector. The first few attempts were just about getting the co-ordination right, so don't pay too much attention to the lower channels, but if you check out the top channel you can see a 2 cm length of deposited alloy. On solidification the deposition was continuous and robust. And this was only the fourth attempt. The parameters had been a stab in the dark but the final carriage speed was approximately 5 mm/sec and injector motor had been at 10 Volts. It was unhappy and believed the copy protect bit to be set until I turned the I/O Wait up to 17 in the hardware settings and picked "Windows API" to control the serial port. Now I can reliably program 16F628A's using hex files of my own creation that were compiled with sdcc. It sets like a rock. In addition it is a near-perfect support material for FDM, because it is water-soluble. The good track is actually two, one laid on top of the other after the first dried. They stack well, and are about 1mm wide. This is too fat because I used too fat a hypodermic needle, but the process actually seems to work better the finer you go. However, like any good cook, you have to avoid lumps when you mix the icing sugar - sieve it first... To get the good track I had to anticipate the starts and ends with the panic button, making the motor run before the robot started its movement, and reversing it for a few seconds before the end to avoid blobbing. The problem is the elasticity of the syringe-pump components, which store pressure energy and cause the flow to continue after the pump motor stops. So finally I made a crude valve on the end of the syringe by interpolating a 2cm length of silicone tube between the syringe and the needle. The result would no longer fit in the syringe pump nor on the robot, so I just pressurized the syringe permanently using a spring, and clamped the silicone tube in a pair of long-nosed pliers. This gave perfect control, and you can sign your name with the thing. On the left is a micropipette tip. This has a hole in the end with a diameter of 0.4mm, which is about the same extrusion diameter as commercial FDM machines. It is a throw-away item costing pence, and for RepRap may represent a better bet than syringe needles as its tapering form offers less flow resistance. In the middle is the cut-off end of the tip in a silicone tube, with a diagram showing a pressurized reservoir of deposition material and a simple clamp (A). The clamp is all that is needed to make a very effective valve. This could be opened and closed with a solenoid, or maybe a radio-control servo (right). A simple string-weight-and-pully experiment (below) shows that the force needed to shut off flow in the tube is 13N, though this may be a bit higher if the upstream pressure is greater than the 300mm water head that you can see in the picture, and a bit lower if the tube were to be squashed using a sharp edge instead of the flat face of a pair of pliers. For other materials (polymorph, Wood's metal) the pipette tip can withstand temperatures of about 100 degrees C (maybe higher, that's just as far as I got), and the silicone tube is happy up there too. We've had a bit of a milestone in that Adrian has used the ArtOfIllusion package to output a solid object on the StrataSys FDM machine for the first time. This proves that we can now generate the STL using an Open Source toolchain. Picture is here. I've been using stlview to examine STL output as a quick sanity check here in NZ. This viewer is cross-platform and GPL'd. Additionally, the AoI team may be able to develop a way of creating output from their renderer in 'slices'. One neat feature of AoI is its ability to output rendering as a vector as well as a bitmap. A 'slice' of the model could be output in SVG, for example. This allows the definition of such tricky things as wall thickness and filling with crosshatch. Some parts are being designed with 4mm holes on a 12.7mm (1/2 inch) pitch, so that they will interface easily with Meccano testbeds. I've found a GPL'd 'C' compiler and a PIC simulator that we can give away with the project. I have successfully used the GPL'd http://sdcc.sourceforge.net/ compiler and the GPL gpsim http://www.dattalo.com/gnupic/gpsim.html emulator to create and run PIC programs for a variety of target devices. Some - documented - fiddling is needed during install and I have joined the sdcc mailing list to try and eliminate this. I'm running Linux, but the packages work on Windows too. 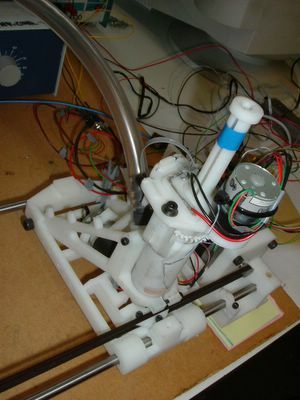 By integrating test probes into the bed of the RepRap, and possibly using a wandering probe (single or multi-tip) attached to the deposition head, the assembled parts could be tested during the assembly process. Dud parts could then be either discarded or manually fixed. PIC devices and similar could also be programmed in situ by the RepRap through these test connections rather than by first being placed in a programmer; the user need then only place the part once. A probe tip could also be used to break circuit links that are only required during the assembly process. It might be beneficial to add a laser pointer arm to the setup so that the RepRap can point out locations that require user intervention such as component placement etc. If we use a blue LED for photosetting compounds this may suffice instead. Might also assist with alignment. Of course, addding a camera as well that plugs into the PC would provide a 3D scanning platform.